Discontent over winter storm cleanups are nothing new in Springfield. It’s hard to compare to the long past, but post-Control Board, inevitably, there are bad cleanups and good ones. The one follow this past Tuesday’s storm was not among the city’s best. It was only inevitable for complaints to roll in, including on the Facebook page of one of the arguably most active city councilors on social media, Adam Gomez. Ward 1 covers downtown and the North End’s Brightwood and Memorial Square neighborhoods. In another time, complaints like those Cignoli critiqued might have happened in public like via television or print. But a public back and forth between constituent and official would probably go unrecorded. Residents might encounter their councilor at the grocery store or at political watering holes like the Cityline or the Fort’s bar. This may be the closest parallel to Gomez’s Facebook pages. Moreover, as the city has diversified, the universe such “public” venues reach has gotten smaller and smaller. Even in a city like Springfield, where civic virtue is at a low ebb, a public square has formed around social media, most prominently Facebook. Almost every councilor uses social media to engage constituents if to varying degrees. Many use personal Facebook accounts. Other keep official pages or tweet. In both groups, there are some who try harder than others. But it is hard to argue Gomez, who maintains a steady stream of Facebook and Instagram posts, has seized upon social media with the most fervor. His closest competitor may be Ward 5 Councilor Marcus Williams. Both comment on national issues as much as city concerns, but Gomez again seems to outstrip in sheer volume. Among Hampden county municipal officials, only Holyoke Ward 4 Councilor Jossie Valentin may rival him in social media usage. Like Gomez, she represents a socioeconomically disadvantaged population. In addition to his own circle of friends from before his election, Gomez has built a broader audience. Facebook’s algorithm rewards consistent activity. His posts will show up in feeds of friends of friends or rank higher in searches, perhaps even for those not actually looking for politics. This kind of phenomenon is not foreign to super-activist communities like Northampton or tech-savvy Cambridge. But in post-industrial cities like Springfield, where a once-healthy democracy was beat down long ago, it remains novel. 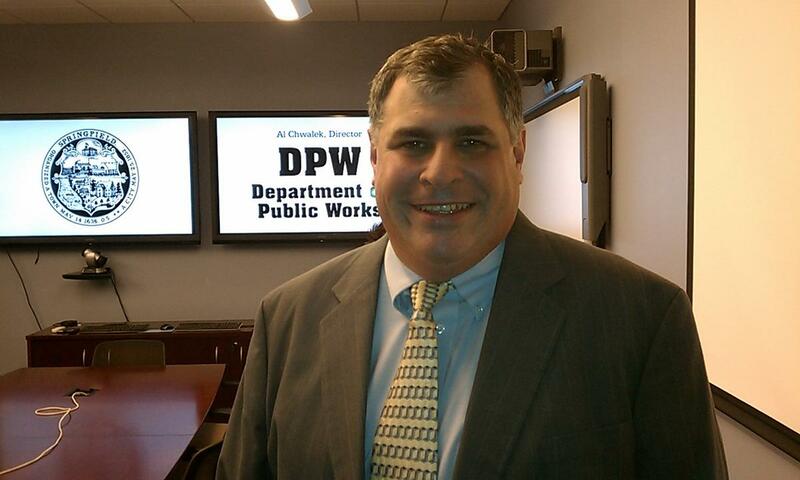 Cignoli, the DPW director, is not a technophobe. He uses Facebook and his department has a page. The DPW’s page appears to predate the city wide page and it posts relevant updates frequently. Cignoli and his department do not appear digitally illiterate. When he got the job, he said improved communication with the public was a goal. But until recently, Springfield’s political culture—even as the bureaucracy tried—did not engage people on social media as Gomez has. Therefore, that citizens—particularly those who perhaps not usually comfortable or vocal enough to contact any councilor—would to call attention to issues at councilors’ invitation may seem like a shift. The coffee klatch of complaints on Gomez’s Facebook page—which he dutifully acknowledged like any good pol—was not cowardly lobbing bombs at DPW. Yet, if your experience is complaints go through certain channels to resolution, this might seem like brandishing torches and pitchforks from the safety of Facebook. That’s not to defend Cignoli’s choice of language. He will no doubt face pressure to apologize for the remark. If for no other reason, that will avoid a row with the Council. The body is still at some of a cold war with the mayor’s office. The bureaucracy strays into that crossfire often enough. It can ill-afford to anger those who approve its budget or possess the power to reorganize it. To Cignoli’s point, it is possible that councilors, Gomez included, were not prompt enough in conveying snow removal concerns. They will have an opportunity to do so at Monday night’s Maintenance & Development Committee meeting scheduled for 6 pm.